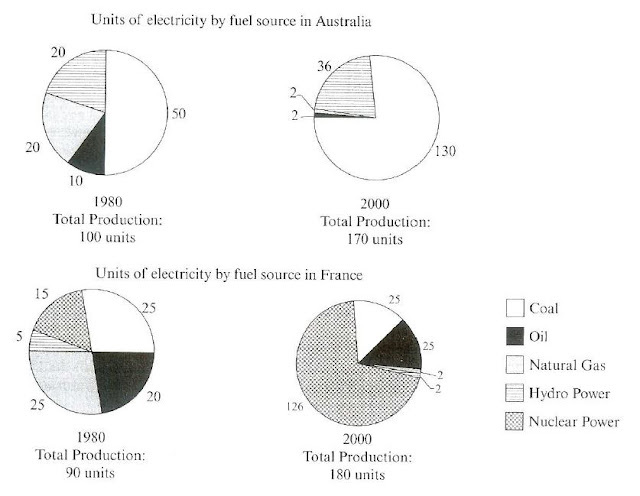 The pie charts below show units of electricity production by fuel source Australia and France in 1980 and 2000. Summarise the information by selecting and reporting the main features, and make comparisons where relevant. The pie charts represent the rate of kinds of fuel source which were used to generate power in Australia and France in the years of 1980 and 2000. It is evident that coal was primarily exploited in Australia whilst there was a remarkable increase in using nuclear power in France. As can be seen in the charts, in 1980, Australia produced more power units than France. There was a mass use of coal to produce electricity in Australia (50%), which doubled that of France. Next came natural gas and hydro power, which devoted 20% for each to the production of power. By contrast, in France, both natural gas and coal made the biggest contribution to power production (25%) whilst hydro power only occupied 5%. In 2000, although the total amount of power generation nearly doubled that of 1980, Australia created less units than France (170 and 180 respectively). Once again, coal was the greatest constituent of the production, which was followed by 36% of hydro power. On the contrary, in France, there was a significant rise in the use of nuclear power to create electricity (126%). The exploitation of natural gas and hydro power, nevertheless, dramatically plummeted which humbly accounted for 2% for both of them. In conclusion, after 2 decades, the production of electricity in both Australia and France went up substanially. While coal was primarily used to generate power in Australia, people tended to utilize more nuclear power in France. As can be seen in the charts, in 1980, Australia produced more power units than France. There was a mass use of coal to produce electricity in Australia (50%), which doubled double that of France. Next came natural gas and hydro power, which devoted 20% for each to the production of power. By contrast, in France, both natural gas and coal made the biggest contribution to power production (25%) whilst hydro power only occupied 5%. Ielts Task 1_ The pie chart below shows how electricity is used in an average English home. Illiteracy has traditionally been viewed as largely a third world problem. However it is becoming apparent that in countries such as the USA and Australia, illiteracy is on the increase. Discuss possible causes for this and its effect on society. Many people assume that the goal of every country should be to produce more materials and goods. To what extent do you agree or disagree that constantly increasing production is an appropriate goal?